PayPal, is an eBay Company,It enables any individual or business with an email address to securely, easily and quickly send and receive payments online. scroll down and on the right sidebar, find the box labelled key features, click on the link named "Donations"
Down below you can customize your paypal button by selecting options like using smaller button, displaying credit card logos, changing language, currency, contribution amount or use your own graphic as a button. Step 2 & 3 are optional and requires a business account, so leave them for now. and click on create button. On the next page, copy the entire code from the textbox and paste it into your template of your website or blog, where you want it to appear. Congratulations! 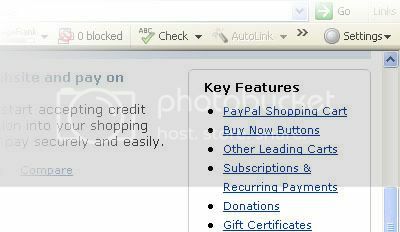 You have just added paypal donate button to your blog. Great! I'm going to try this! 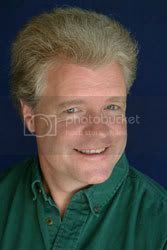 I was looking for information like this. OK but PayPal Donate for me implies that the money is going to a charity! Fantasitc! I've been looking for something like this to stick on my new blog for a while. Great blog!! Thanks for the info!! The button only appear if you add it in the page element. How about in the post? It is not visile? Is there anyway I can add button in the posts? @Joseph, Of course you can add the paypal donate button on your individual posts, that's how I created the live demo on my post. The procedure for generating the paypal code is the same, then when you are creating a new post, you have to make sure that you are on the HTML mode(which will accept html data) and NOT the compose mode. Need my tutorial for that? let me know. Do u need a paid account to get this. 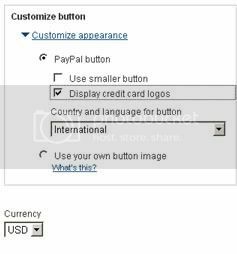 I've try to add the Paypal buy now button into one of my blog, But when I click on the button, it pop up a message "The seller accepts encrypted website payments only. You cannot pay the seller through un-encrypted buttons." that great... i planning to make 1 at my blog, but wonder does there any charges? Fantastic, thank you. Just what I was looking for. @Anonymous, Yes of course, although this tutorial only shows how you can add this button to your blogspot blog, If you want to add to any website, you can get the code from paypal and paste to your website and it will work. Great I will try to add this on my blog..thanks for such a wonderful tip on how to do this. When I add this button to my site, and users click on the donate button, the landing page shows my elail address which i dont want!? How can i add the button to not make my email appear please? Thanks, will add Paypal donate button soon. Nice article, I need this article to add paypal donate in my site.. thanks dude.. like this.. So if I have an account already set up, where exactly does the $$ go once someone donates? Suppose If you set up a paypal a/c, then the donated amount is credited at your paypal a/c which can be used for online transactions(where paypal is supported) or you can request a cheque payment from paypal.